The Frontier Force Regiment has 52 battalions and is primarily composed of Pashtun soldiers -- who form the majority population of the Northwest Frontier Province where the unit is based. The Frontier Force Regiment is therefore sometimes called the "Pashtun Regiment." 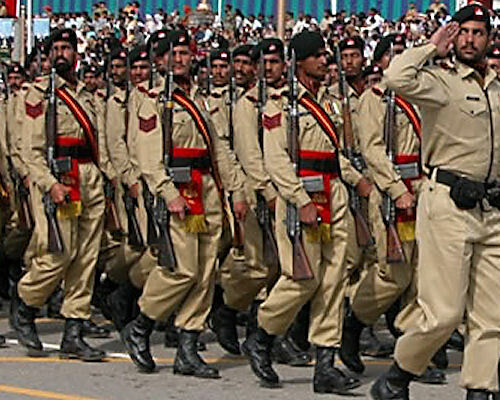 The military has established quotas for Punjabis and Sindhis within the Regiment. The unit is based in Abbottabad, which also houses major facilities for the Baloch Regiment. The Frontier Force Regiment was created in 1957 by joining together three older regiments: The Corps of Guides, the previous Frontier Force Regiment and the Pathan Regiment. The earliest of these was founded in 1846 by the British for patrol duty in the lawless border area with Afghanistan. These militias were known as the "Punjab Irregular Forces," which gave rise to the nickname "Piffer." This is still used to refer to the Frontier Force Regiment even though it is now a fully professional and partly mechanized part of the army. The FF regiment has participated in all of Pakistan's wars since the regiment's inception, including the smaller Siachen and Kargil conflicts. In 1991, the Regiment also contributed defensive troops to the UN-backed Coalition against Iraq, and the following year, it played a major role in the UN relief mission to Somalia. Armored units of the Frontier Force Regiment rescued trapped American special forces soldiers during the Battle for Mogadishu. The PIFFERs are a tight knit brotherhood of soldiers, bound by a distinguished military history, a long tradition of soldiering and a strong foundation of regimental traditions. They are disciplined, hard fellows, full of natural military instincts. They are a special breed, purified in the inferno of objective realities, demanding courage, loyalty and steadfastness. During 59 years of Pakistan's history, not a battle has been fought without PIFFERs. Frontier Force Regiments have invariably contributed to the success of every major undertaking: from Chamb-Jaurian to Hilli, from Dinajpur to Sulemanki, from Siachen to Rann of Kutch; Frontier Force Regiments have always been in the eye of the storm. From the turmoil in the wake of Partition to the floods and earthquakes in the most inhospitable terrain, Frontier Force Regiments have assisted the civil administration in an unflinching manner. In over one hundred and fifty years of its existence, the Frontier Force has kept pace with the changing times. It has developed to meet the requirements of the Army and the Nation, and to absorb various fundamental changes in the battlefield environment, encompassing induction of new weapons and equipment. The Frontier Force Regimental Centre, nestled in the Abbottabad hills, is the home of all PIFFERs. Previously Kohat, the largest and most popular PIFFER station, became the home of PIFFERs after World War I, to include PIFFER Mess, PIFFER Memorial and PIFFER Church. The two original training battalions mentioned under the 1922 reorganisation, moved to Sialkot (12th FF Regiment) and Abbottabad (13th FF Rifles). Both centres did a magnificent job in sending well trained recruits to various theatres during World War II. The training battalions were expanded into full-fledged centres as the war progressed. At Partition, the Frontier Force Regiment Training Centre moved from Sialkot to Abbottabad. Once the three PIFFER groups were amalgamated in 1956, the Pathan Regimental Centre at Kohat was also absorbed at Abbottabad. Since then, the Centre trains recruits and acts as the spiritual home of all PIFFERs. The PIFFER Museum, inaugurated in 1981, is attractively laid out and well stocked with a rich and impressive collection of medals, weapons, dress and insignia, portraits and flags, history books, albums, paintings, cutlery and musical instruments. Partition resulted in a large number of British PIFFERs returning to the UK. The strong PIFFER bonds and nostalgic memories of many years of war and peace spent in PIFFER units, led to the formation of a formal PFF Association in the UK, in 1948. The association had first been mentioned by General Rob Lockhart in 1945. The Association actively maintained contact among the British members and with Pakistani PIFFER officers, the mother Regiment and units in Pakistan (and those in India). Its activities included reunion dinners, visits to Pakistan and India, issue of a journal and a host of other activities. With four issues of the journal a year in the earlier years (made possible by a large membership) dwindling numbers and lengthening obituaries led to issue of a single number annually, in later years. The final issue was published in November 2000. The same year, surviving members led the Association to vote itself into oblivion. A 'Residual Committee' remains, to deal with the PIFFER affairs in the UK, and maintain contact with the PIFFER Centre at Abbottabad. For half a century, the association did sterling work to keep the old bonds alive.